Chief Jeremy Klein would like to announce that the Lafayette Township Fire Protection District has been awarded a grant from the Horseshoe Foundation of Floyd County. 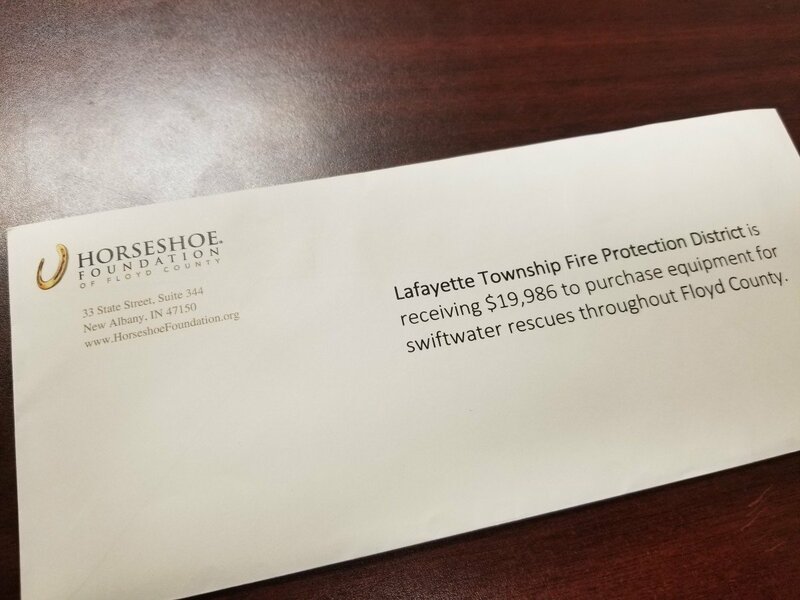 The Board of Directors of the Horseshoe Foundation of Floyd County approved a grant for $19,986.00 to Lafayette Township Fire Protection District to purchase Swiftwater and Flood Rescue Equipment to be utilized for Incidents throughout Floyd County. The Lafayette Township Fire Protection District is intending to purchase a rescue boat to utilize during emergency and rescue incidents when called upon for flash flooding and river flooding. The department responds to all areas of the county in the time of need when flash flooding or river flooding occurs. Floyd County has approximately 7,549 acres or 11.8 square miles of floodplain. 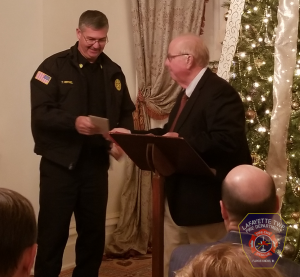 Chief Jeremy Klein and Deputy Chief Terry Herthel attended a Grant Award Ceremony hosted by the Horseshoe Foundation of Floyd County and held at the Culbertson Mansion to accept the award. Lafayette Township Fire Protection District encourages citizens to NOT drive across a flooded roadway or into flooded areas. It is NEVER safe to drive or walk into flood waters. Know what to do before, during and after a flood. Turn Around, Don’t Drown! On behalf of the Lafayette Township Fire Protection District, Thank You Horseshoe Foundation of Floyd County!! !